So delighted with our coverage in Brides of Kerry Wedding Magazine this month with a fantastic interview with our own wedding coordinator Pauline Moroney pinned by one of our lovely locals Tracy Healy. 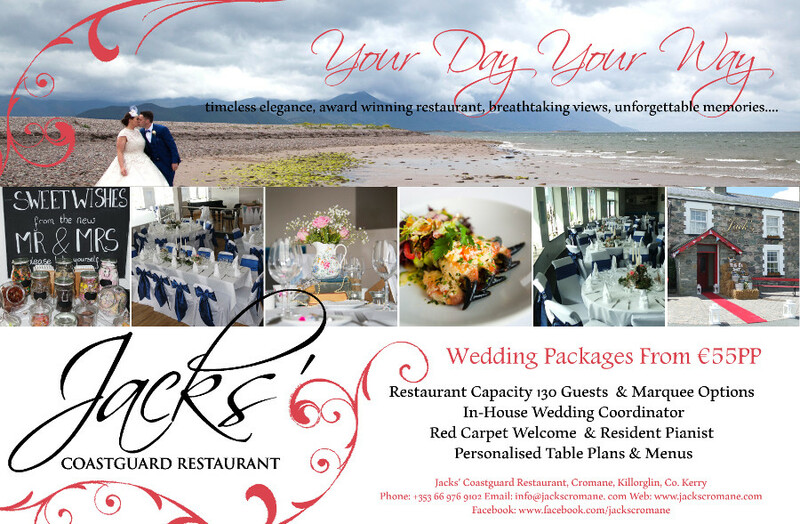 A firm favourite and award winning wedding venue, Jacks’ Coastguard Restaurant is situated in the idyllic village of Cromane, Co. Kerry on the Ring of Kerry and Wild Atlantic Way just 10 minutes outside Killorglin. Catering for up to 130 guests for the perfect intimate wedding or the ideal location to add a marquee with a large seafront garden space should you wish to invite a few more guests! But besides the obvious intimate setting, surrounded by beautiful scenery and just all round perfect wedding location we were lucky enough to catch up with Jack’s’ secret weapon Pauline Moroney – Wedding Coordinator, Marketing & Events Manager, mommy of 3, keen rower and Pinterest. In the days leading up to a wedding she’s been known to visit her neighbours for ivy and other bits and pieces or been seen along the Kerry countryside collecting flowers. She’s usually moving too fast to catch but today we were lucky enough to get her on her Tea break enjoying her chocolate addiction top up! 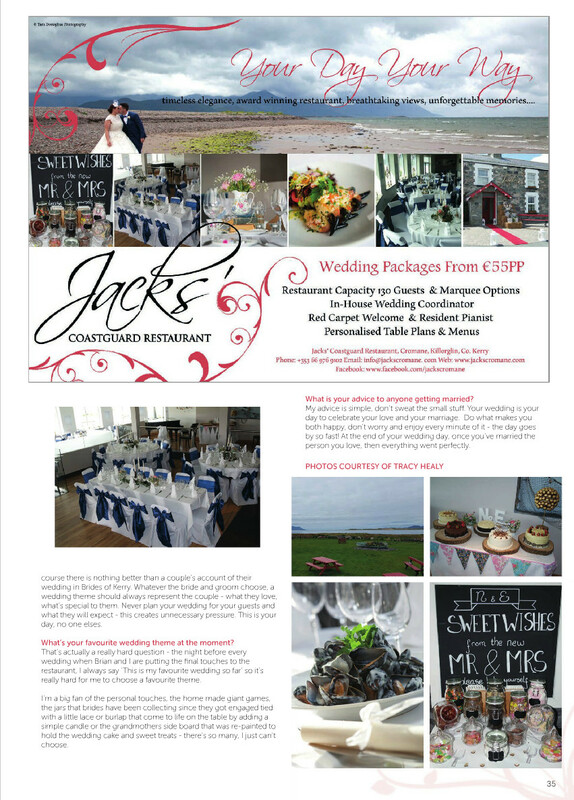 Pauline, you have been Jacks’ wedding co-ordinator for 6 years, in your opinion what makes Jacks’ Coastguard Restaurant the perfect wedding location? Looking back on when I planned my own Wedding, I know what it’s like and the enormous decision couples have to make on where to have their day, so for me, I feel Jacks’ is really different. It’s unique, it’s got great food, picture perfect scenery for your photos and it’s a blank canvas for our couples to make it their own personalised space for the day – it ticks all the boxes really. We have heard your the planner extraordinaire! I’m very lucky to be part of such a great team in Jacks’. Brian, Jonathan, JP and all the guys there are amazing. Our motto is Your Day Your Way so no request is too big or too small, I love the challenge of making it happen and seeing a plan come together in such a special way. I enjoy getting involved with our couples, talking through their ideas and how they see the day unfolding. Your wedding are always associated with uniqueness and extremely personal, how does that work?Brian, the owner and I always have an initial consultation with our Brides and Grooms which is so important because a couple must choose the venue not only on location, food and service but also trust that we can deliver their dream. It’s probably one of my favourite meetings, we really get a first glimpse of what they like, what their vision is for their day… It is so important to couples that you can see their vision, its such a personal day and we love getting to know them. Between Brian and I we have many combined years of event planning and management so we are in constant communication with our couples from start to finish.It’s our aim to make them and their loved ones feel relaxed and at home with us in Jacks’.We can accommodate most requests from Marquees to pig on a spit to a specific food theme, champagne fountains, fire pits or flyaway lanterns! You name it, we’ll try to get it. What can someone expect from a wedding at Jacks? A wedding at Jacks’ will always be exactly how you imagined it and if we can manage it maybe even that little bit better! No ask is too big for us. Jonathan our head Chef, has colour co-ordinated desserts in the past to match the Wedding Theme, JP learned the theme tune to the Sunday Game for a Bride & Groom first entrance and Brian has a new found love of paper lanterns and bunting and can now tell the difference between baby pink and blush pink 😀 Honestly though, the dedication and professionalism of the team here is superb – we get the best buzz from seeing our couples celebrate the best day of their lives with their family and friends in a stunning setting complimented by delicious food, a little bit of Kerry charm and a whole lot of fun. We have had some fantastic weddings from importing specialised beers, guests arriving in the garden in a helicopter, creating hay bale couches, making beautiful centerpieces of ivy, roses and whatever I can get my hands on or create from my Pinterest addiction. We also provide the full red carpet welcome, JP playing throughout our reception and meal, personalised menus and table plans and of course your wedding Co-Ordinator – Me! What kind of organising goes into a wedding there? Where do you recommend Brides & Grooms look for some theme inspiration? I love the idea of a scrapbook or mood boards and especially Pinterest Boards as they can be shared with whom you would like so its a great way to keep in touch with a shared board of ideas and finally coming to a decision on the what you want on the day. I absolutely love bridal magazines and just having them to flick through on a night on the sofa for inspiration just gets you so excited for the event to come. I follow blogs for inspiration and of course their is nothing better than a couple’s account of their wedding on Brides of Kerry. Whatever the bride and groom choose, a wedding theme should always represent the couple – what they love, what’s special to them… Never plan your wedding for your guests and what they will expect – this creates unnecessary pressure. This is your day, no one elses. Whats your favourite wedding theme at the moment? That’s actually a really hard question – the night before every wedding when Brian and I are putting the final touches to the restaurant, I always say ‘This is my favourite Wedding so far’ so it’s really hard for me to choose a favourite theme. I’m a big fan of the personal touches, the home made giant games, the jars that brides have been collecting since they got engaged tied with a little lace or burlap that come to life on the table by adding a simple candle or the grandmothers side board that was re-painted to hold the wedding cake and sweet treats – there’s so many, I just can’t choose. What would be your advice to anyone getting married? My advice is simple, don’t sweat the small stuff. Your wedding is your day to celebrate your love and your marriage. Do what makes you both happy, don’t worry and enjoy every minute of it – the day goes by so fast! At the end of your Wedding day, once you’ve married the person you love, then everything went perfectly.